The territory of present-day Cameroon became a German colony of Kamerun in 1884. After the defeat of Germany in World War I Cameroon became a League of Nations mandate territory and was divided between France and Britain to form British Cameroon and French Cameroun. In 1946 the League of Nations mandates were converted into United Nations Trusteeships and French Cameroun started movement towards independence. This territory gained independence from France on January 1, 1960. 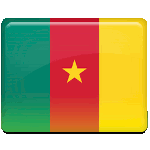 British Cameroon gained independence from Britain and unified with French Cameroun on October 1, 1961. Celebration of Unification Day starts with a parade, the rest of the day is spent for sport activities. A 40-km (less then 25 mi) marathon is annually organized, people also participate in canoe racing, wrestling and soccer matches.